Kim Porto from Long Island runs Poppyseeds Bagels in Matthews. In this New South metropolis, lots of us are from “up North.” Over a quarter of a million of us, in fact. The Charlotte Chamber estimates that one in ten residents of our metro region was born in the Northeast, defined by the U.S. Census Bureau as the broad band of states stretching from Illinois to New York. There’s much to love and discover in the Queen City, but every once in awhile, don’t you just want to find a comforting taste from back home? Here are some places I know about. Got any others to recommend? What are you hungry for? Pierogi. When I lived in Youngstown, Ohio, pierogi were everywhere. What’s not to love about a dumpling stuffed with mashed potatoes or meat or mushrooms, then fried in butter and onions? 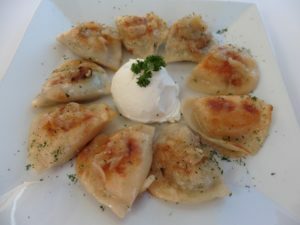 Around Charlotte the only place I know for pierogi is Taste of Europe on Monroe Road near NC 51 in Matthews. Bagels. The ones in the freezer case at the Teeter or Publix just don’t do it, do they? Get yourself to Poppyseeds Bagels on Potters Road out past Matthews, run by Kim Porto from Long Island. Or Poppy’s (no relation) on Providence Road near Sharon Amity. And I hear good things about Bagel Bin off I77 exit 25 in Huntersville. Coney dog. Detroiters have their own hometown hotdog, distinguished by thick meaty no-beans chili that’s almost a meal in itself. Near CPCC’s Levine Campus seek out Omega Coney Island. The weiners — “gotta have that snap,” says owner Corky Manns — and chili are sourced direct from the Motor City. Donna and Brad Battaglia relocated from the Buffalo area, opening Taste of Buffalo in Huntersville. Beef on Weck. 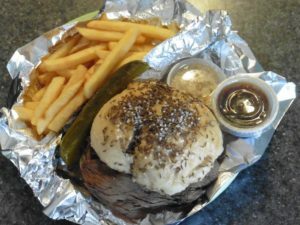 The favorite Friday sandwich in Buffalo, N.Y., is roast beef on a kimmelweck (salted caraway seed) bun. 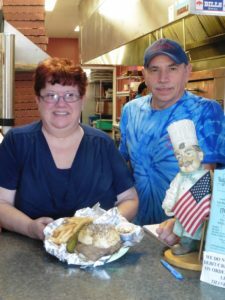 Donna and Brad Battaglia have it every day at Taste of Buffalo just off I77 Exit 25. Plus real-deal Buffalo wings, white pizza and even Labatt Beer. 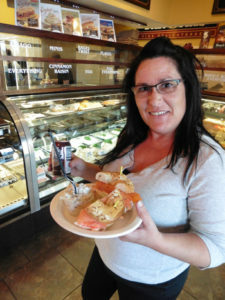 Italian deli. Youngstown and most other Northern cities got a wave of Italian immigrants a century ago, an influx that largely missed the South. 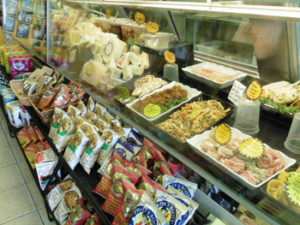 Today the Italian deli is part of everybody’s life up there — salamis, antepasto, sharp cheeses for grating, sweet cannoli. Here, Derado’s Italian Gourmet Market off I77 exit 28 is my go-to spot. For Italian butchershops, try Ferucci’s Old Tyme Italian Market, also off exit 28, or head south to Enzo’s Italian Market in Stallings where housemade sausage is the specialty. 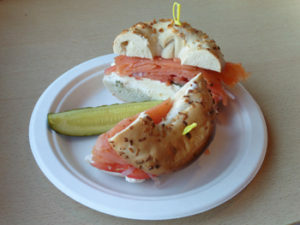 Tuesday – Saturday 11:30 a.m. – 9 p.m.
From Poppyseeds, an everything bagel with lox, cream cheese, capers and more. Monday – Saturday 5:30 a.m. – 6 p.m.
Sunday 5:30 a.m. – 5 p.m.
Monday – Friday 7 a.m. – 8 p.m.
Saturday 7 a.m. – 2:30 p.m.
Sunday 8 a.m. – 2:30 p.m. Beef on Weck at Taste of Buffalo. Derado’s Italian Gourmet Market near Lake Norman sells traditional pastas, cheeses and more. Tuesday – Saturday 10 a.m. – 4 p.m.